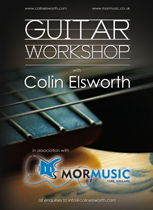 This workshop will turn the players pre-existing knowledge of the pentatonic minor scale into the foundation used to create a number of more sophisticated variations. A clear understanding of, and familiarity with, the minor pentatonic scale (preferably in more than one position) is essential as the workshop will deal with manipulating the various degrees (1 b3 4 5 b7) of the scale in order to make it fit a number of different harmonic contexts. An understanding of diatonic chord harmony would also be helpful. Some of the areas to be covered include the minor6 pentatonic in blues, modal pentatonics, add9 pentatonics, the hindu pentatonic, pentatonic substitutions and the use of pentatonics in a II V I setting. This workshop is aimed at a player that has an interest in developing a more advanced, fusion style soloing vocabulary. They are run in such a way that no-one has to perform on the spot if they don't want to, but each player will have the chance to if they do. The most important thing to try to take away from the 2 hour session is an understanding of the principles involved, so you can then apply them to your own playing at your own pace.